Plenty of sunshine. A stray shower or thunderstorm is possible. High 84F. Winds WSW at 10 to 20 mph..
Pub sign on Edinburgh’s Royal Mile. Mural above fireplace in King’s Outer Hall at Stirling Castle. 12th century Viking-era Bishop’s Palace in Kirkwall, photographed during a break in the rain. “In Their Own Words”: DIGS photographers talk about memorable photographic moments. "Dinna fash," I told myself almost every day of my photographic sojourn to England and Scotland. As every Outlander fan knows, that means “don’t worry,” and I didn’t let the September weather and crowds get in the way of taking photos and enjoying my trip. Inspired by the "Outlander" books and TV show and" The Lymond Chronicles" novels by Dorothy Dunnett, as well as a general interest in Neolithic and Viking history, I visited London, Edinburgh, Orkney, and Inverness on my trip to the United Kingdom. One day I took the train from London to Salisbury to see the Magna Carta in Salisbury Cathedral. The main purpose, however, was to visit nearby Stonehenge. Ever since reading Mary Stewart’s "The Crystal Cave," I’d wanted to visit the prehistoric site. I did an all-access sunset tour, which meant I could go inside the stones after regular visitor hours ended. It was overcast so there’d be no great shots of the sunset, though. But "dinna fash," the cloudy sky was very atmospheric. In London, I had started taking photos of interesting pub signs and I continued doing that in Scotland. 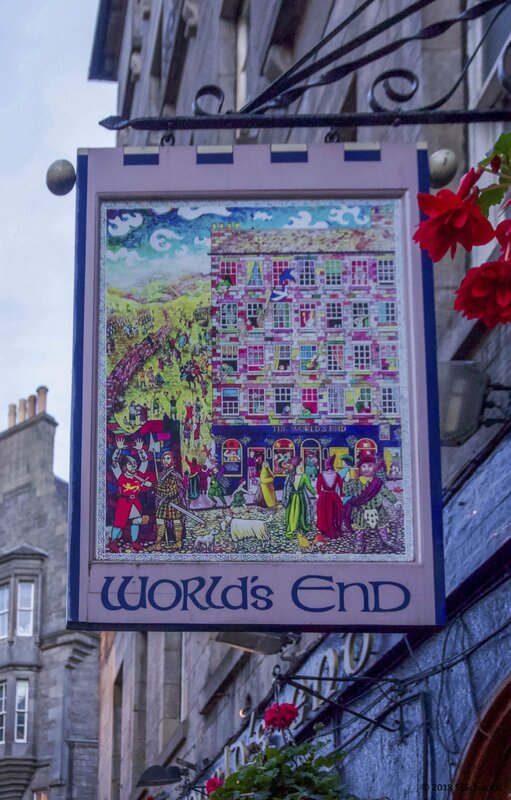 At the World’s End pub in Edinburgh, an "Outlander" location, I ate my first haggis and Cullen skink and both were delicious. Orkney, off the north coast of Scotland, was wonderful but photographically challenging because every day it rained at some point. "Dinna fash" became my mantra since I knew that soon the rain would stop and I’d be able to continue my exploration of the island called Mainland. I used my umbrella to shield my Sony A6000 – I didn’t care if I got wet but I didn’t want to ruin my new camera. "Dinna fash" was applicable at the 14 castles and palaces in Scotland I visited as well, because it was hard to shoot photos without people getting in the way. Patience was key and I also solved the problem by looking for interesting details that would make good photos. So I often pointed my camera at ceilings, tiled floors, and decorations on the interior and exterior walls of buildings. At Stirling Castle, a location in "The Lymond Chronicles," I zoomed in on a mural on a wall. Over the course of my 24-day trip, I took thousands of photos. But "dinna fash," there’s still plenty more of the United Kingdom for me photograph on a future trip.